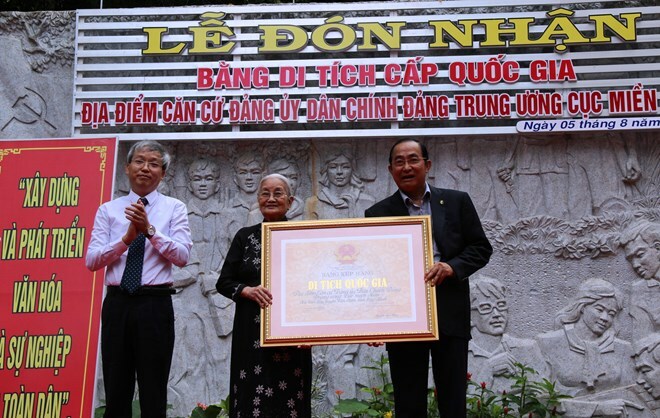 Tay Ninh (VNA) – The headquarters of the former Party committees at civil, political and Party agencies of the Central Bureau for South Vietnam in Chang Riec forest of Tan Bien district, Tay Ninh province, have been recognised as a national historical relic site. The relic site certificate was presented to the liaison board of the Party committees’ resistance tradition club on August 5. Nguyen Van Khoi, a representative of the liaison board, said during the war against the US, the Central Bureau for South Vietnam, led by the Party Central Committee to steer revolutionary activities in the south, assigned the Party committees at its civil, political and Party agencies to be in charge of Party building work. In the spring of 1968, the Party committees called on all Party members and locals to join people and soldiers across the south to wage the General Offensive and Uprising to attack the US puppet government’s headquarters in Saigon, forcing the US to join the Paris conference for peace in Vietnam and then withdraw from southern Vietnam in 1973. Under the leadership of the Central Bureau for South Vietnam, the Party committees at its civil, political and Party agencies directed preparations for the Ho Chi Minh Campaign, helping liberate the south and reunify the nation on April 30, 1975. In April 1977, the Party Committees were dissolved as they had fulfilled their tasks, Khoi noted.